This article is about basic laser cartridge printing defects, which you might confront while filling the cartridge yourself. At first you need to take a close look on the cartridge refilling issue. Find a necessary instruction and inspect it. Buy the proper toner. Since you don’t have enough experience, you should better ask an advice from the shop assistant. Specify which one is the most popular, which models the one suits best. Preparation is done, instructions are read, cartridge is filled. Congratulations! Now you need to test your cartridge. Put it in your printer and run the test sheet. If everything is ok and the print looks nice, congratulations again! But if there are certain imperfections, we will investigate the issue. Essentially, there are only three contacts inside of the cartridge, the absence of which may cause certain printing defects. In this article we’ll discuss general malfunctions, such as getting black or completely white sheets of paper during printing. Let’s start with the completely white sheet of paper issue. At first you need to establish whether the problem hides in the cartridge. If you have another cartridge that’s in a working condition, try it out. 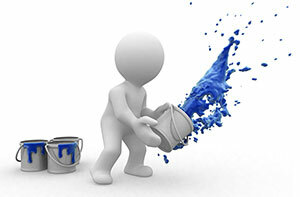 If everything is ok, than it is your cartridge, if not, than you need to go and repair your printer. But if there’s no other working cartridge to test out your printer, you need to test both, cartridge and printer before refilling your cartridge. So, we’ve determined that the problem is with your cartridge. What exactly may give this kind of a problem? There are two possible reasons for no color on your paper. The first one is the OPC drum loose connection. Maybe the contacts were damaged while you were disassembling the drum. These contacts are located inside of the OPC drum, and could be seen through axial bores, which are designed to hold the drum inside of the cartridge. Contacts look like metallic petals, and usually it’s enough to just bend them a bit so everything will work again as it should. 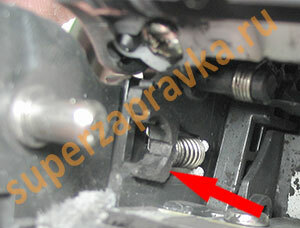 The second reason is the loose connection of the magnetic roller. Disassemble the cartridge carefully and look at the contacts of the magnetic roller. These contacts are basically like metallic petals or a mainspring; you can see that on the left image. 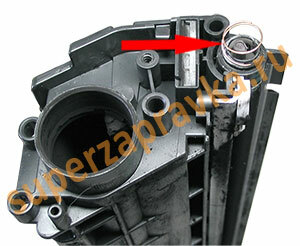 Because of the lack of experience the spring is usually jammed with the cartridge side lid. And further printing process causes this sprint to deform or tear, what breaks the proper contact between the magnetic roller and your printer. To eliminate this problem you need to somehow restore this contact – change the mainspring or the magnetic roller itself. And the third reason, that is very unlikely, is the fixed shutter of the OPC Drum. The laser ray is not reaching the drum and that’s why you have completely white paper at the output. This is unlikely because the closed shutter will be preventing the paper to come out of the printer, and the paper will be jammed even before it will contact the OPC drum. Now, the black paper issue. As we’ve said earlier, everything is about contacts. We’ve discussed two of them, only one left. The primer charge roller (corotron). So, the absence of this contact is causing the black color on your paper. One of the possible reasons for that are incorrectly installed charger roller gears. One of them is current-conducting. You can see the one on the right picture. So, should you interchange them, the voltage won’t be reaching the roller and the OPC drum won’t be charged, what will cause the completely black printed page. Or it may be the malfunction of the charging roller itself. Receiving completely black page is less likely, but there will be some blackness. So, that’s pretty much everything about general cartridge refilling issues. There are many different visual printing defects, but we will discuss that in the next article. You can find a lot of useful information on cartridge refilling forums. Ask and you will definitely receive a feedback.